When people who cook by the seat of their pants try to explain our process to friends who want to learn how, we tend to rely on a collection of well-worn truisms: “use fresh, delicious ingredients,” “cook with the seasons,” “taste as you go,” etc. One of my favorites is “things that grow together, go together.” By this, we mean that vegetables coming into season at the same time of year, in the same region, tend to taste delicious when combined. (You can also take a skeptic’s view: of course it’s true, because then everything’s fresh, but there’s nothing magical about it. True enough, but it still works.) Tomatoes and basil, corn and hot peppers, winter squash and dried beans: classic combinations. Sometimes, I end up stretching that dictum a little further, though. I’m not a farmer, though I know many of the producers at my local farmers market. In fact, the only things I grow myself are wildflowers in my backyard. So for me, my ‘field’ is often the produce section of my local grocery, which can yield some interesting versions of ‘growing together’. This salsa is a perfect example: even before I walked into the grocery last week, I could see a big display of Hatch chiles, flown in from New Mexico. The Hatch chile, and the New Mexico chile more generally, is one of the cornerstones of modern New Mexican cuisine, and around harvest time the smell of chiles roasting in large drums is everywhere in the region. I was just about to grab one of the tubs of roasted chiles, when suddenly an amazing smell hit my nostrils. It was candy-sweet, and intense. Pivoting around, I saw a mound of perfectly ripe white nectarines, which were perfuming the whole area with their scent. There is absolutely nothing I love more in the summer than stone fruit, dripping with juice and slipping softly between my teeth. Immediately I changed my mind and grabbed the fresh chiles instead of the roasted ones — I couldn’t wait to taste the sweet nectarines against the hot, bitter greenness of the Hatch chiles. Not that I’ve gotten to eat a lot of this! 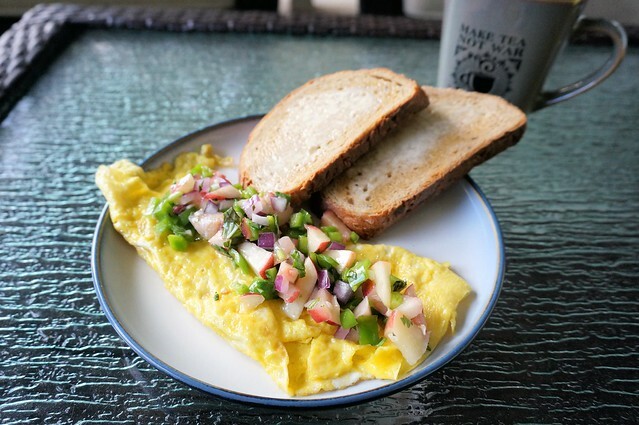 I’ve made three batches, and other than the bit I ate on an omelet for a breakfast photo shoot (a serving suggestion that I can’t recommend enough, by the way), I’ve barely gotten three spoonfuls. Every time I turn around it seems like Jarod’s saying “oh, I had more of that salsa — it’s great!” And by ‘more’ he means ‘all of it’. So know that this has the husband seal of approval, but take that as a warning to hide some away for yourself! When the summer stone fruits are at their peak, it’s hard to imagine doing anything with them other than eating them over the sink, sweet juices dripping down your chin. 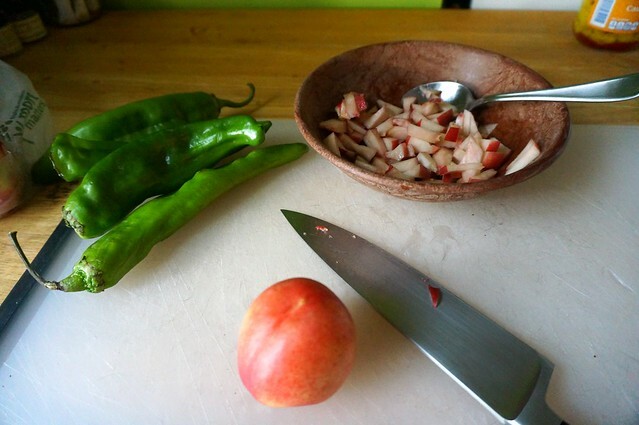 But if you can possibly hold a couple of nectarines or peaches back, try this salsa. 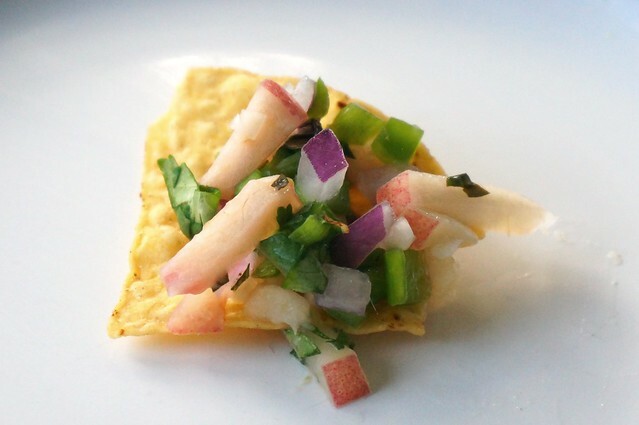 It’s sweet and refreshing, but also has a sharp grassy spice from the Hatch chiles. It’s great with tortilla chips, but I’ve also enjoyed it on an omelet, stirred into a corn chowder, and on grilled meats. If the rate of consumption in our house is any indication, this recipe is going in our permanent summer rotation. Combine all ingredients in a bowl. Stir to mix, taste, and add more salt or citrus if necessary. Chill for at least 30 minutes, and serve with chips or as a topping on another dish. Hatch chiles get all the name recognition, but any long light-green chile should work here: another variety of New Mexico chile, Anaheims, Big Jims, etc. 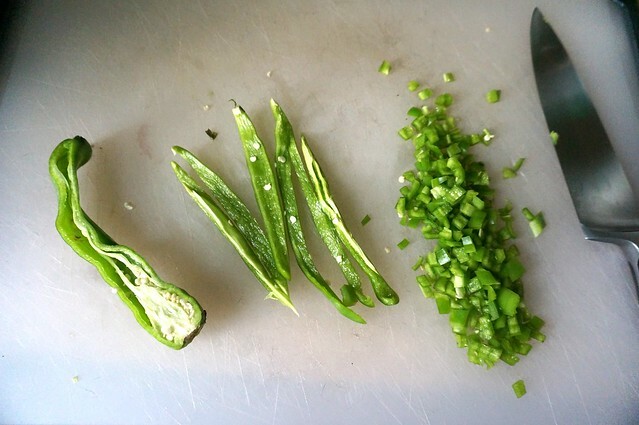 You could also sub in a poblano, or even a jalapeño, if necessary, though that will definitely change the flavor. Make sure you don’t make it too hot for your taste! I made this with white nectarines that were calling my name at the grocery store, but any variety of peach or nectarine can be swapped interchangeably. 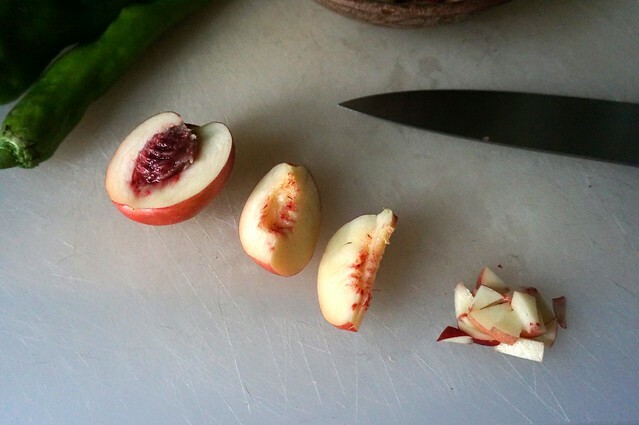 For that matter, most any stone fruit would be delightful, though a little different. Have some alluring apricots, or some perfect plums? Sounds like you have yourself a salsa. Can you double this? Treble this? Yes, you can. And yes, you should. I wondered what hatch was! Looks wonderful. Perhaps it’s a sandwich, then. Or a hotdog.